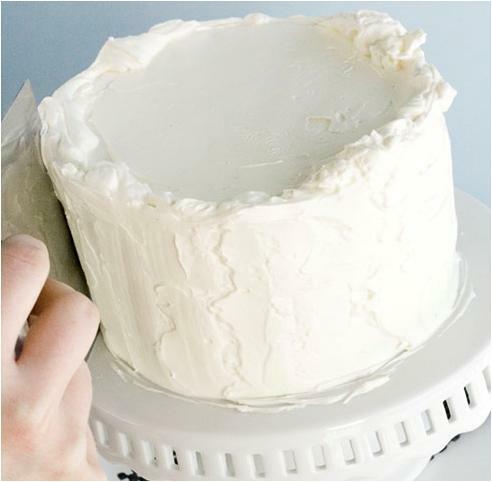 Frosting a cake is an interesting activity and it helps seal in your favorite cake’s moisture. In addition to that, it adds another element of taste and texture. 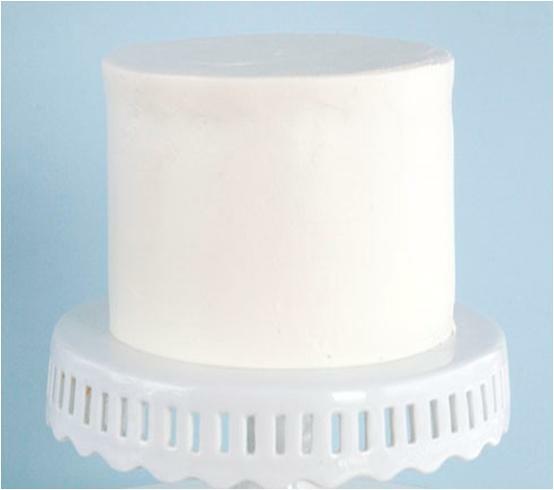 For a perfect frosting of the cake, it is better to make sure that the various layers of your cake are thoroughly cooled and free of crumbs before the application of frosting. An appealing cake adds a bit of ceremony to your memorable occasions like birthdays, anniversaries etc. Therefore, read this simple article and frost your cake to give it an attractive finishing touch. First of all deflate the frosting of your cake in order to remove air bubbles and crumb. For this purpose you just have to beat the frosting at medium speed for approximately five minute or until smooth. 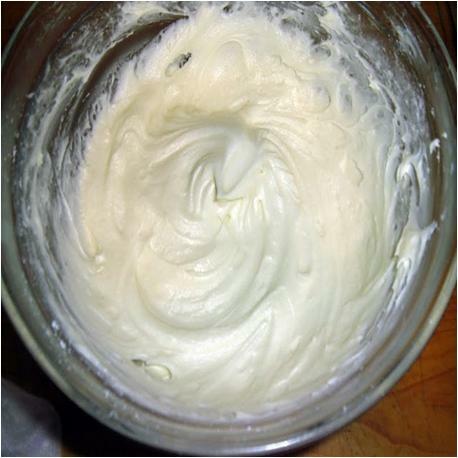 Use a hand mixer for beating the frosting. Place the stacked cake on a turntable and drop on a small amount of frosting (may be 2 scoops) at the top of it for the first thin layer of crumb coat. Note: Make sure not to use too much frosting for the initial layer as it requires small quantity just in order to hold in the cake crumbs and stop them from getting into the final coat. 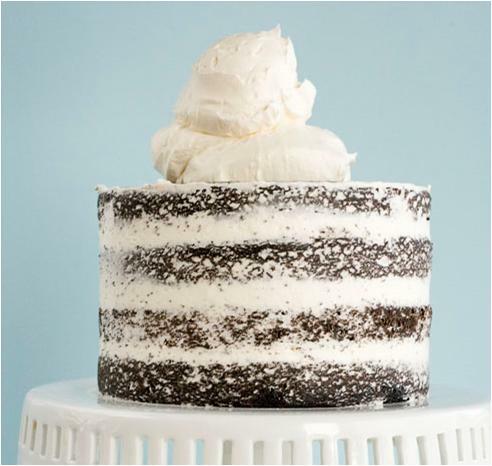 Now, grab a medium offset spatula and gently press the mound of frosting down and out, scattering from the center of the cake to the edges in a swiveling motion. Note: Do not scrape the frosting too hard as it can tear into pieces. 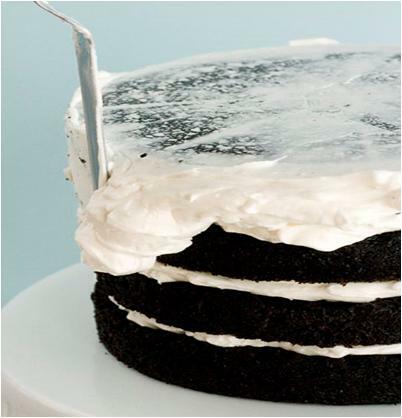 Carry on thinning out the frosting outward from the top of the stacked cake so that it hangs over smoothly. 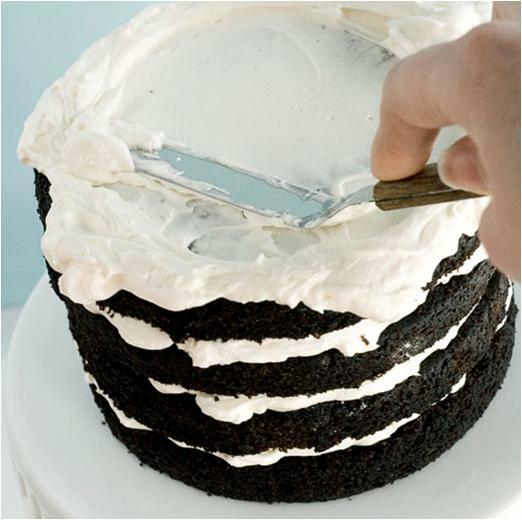 Now, start spreading the frosting around the sides of the stacked cake in order to cover every inch of your cake. Note: Make sure to be very careful while spreading the frosting as it is very difficult to remove once you apply it. 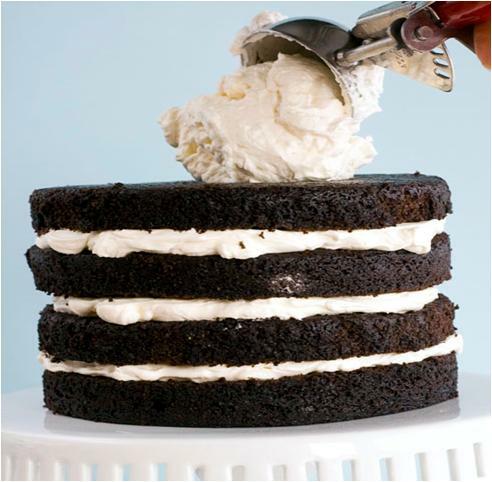 Once you spread the frosting all over the stacked cake, take an offset spatula and thin the frosting as much as you can. 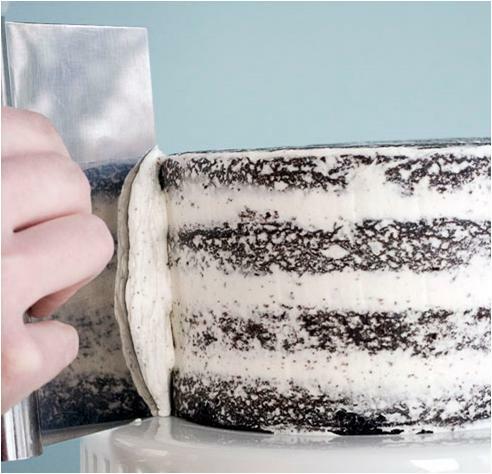 It helps in sealing in the crumbs and to give your cake a neat look. Thinning the frost is very simple as you just have to drag the frosting from edge of the cake, over the center and have to sweep the excess frosting off at the end. 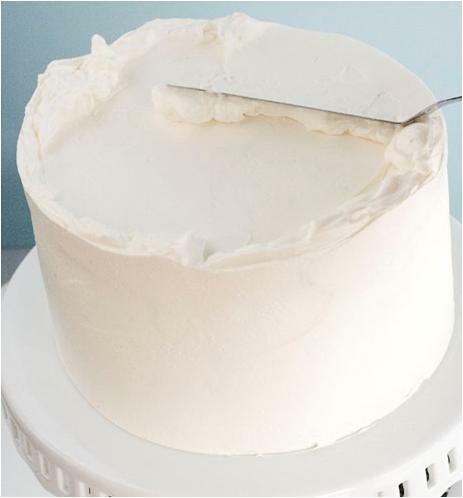 Pick up a medium bench scraper; hold it firmly enough at 45 degree angle to the side or top of the cake and spin the turntable towards it in order to scrape off the extra frosting. Note: Do not hold the bench scraper too firmly as it can cut the cake. 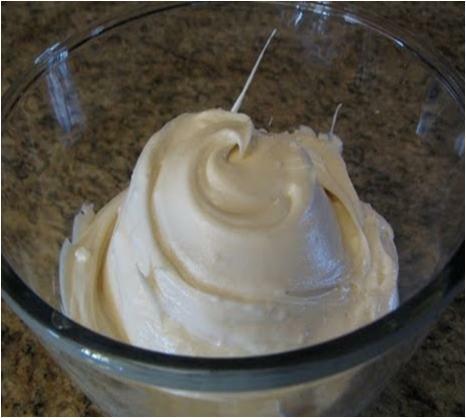 Now, transfer this frosting to a serving bowl and set it aside at room temperature. Take a disher and scoop on a pile of frosting at the top of the cake. 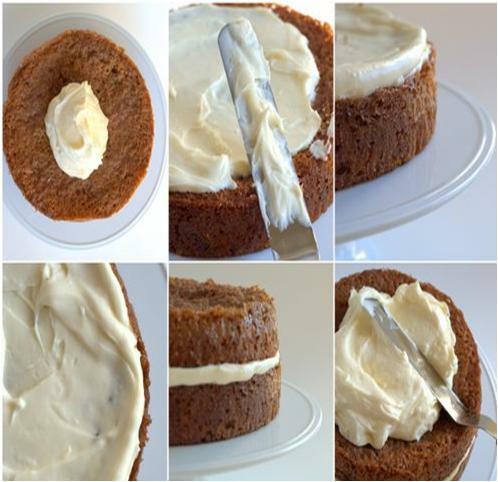 Add the frosting according to your requirement this time, making sure it is enough to wrap your cake properly. However, 3 scoops are enough for a regular cake. 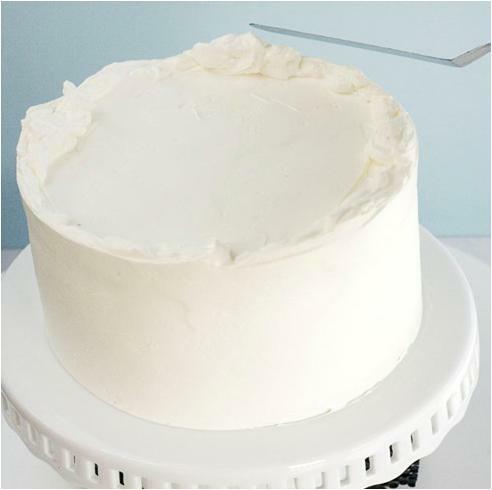 Grab the offset spatula again and use the same method that you used in step 2 to 9 in order to flatten out the mount of frosting all over the previous layer over the cake. Make sure to have a full grip on the spatula in order to maintain an even layer of frosting. 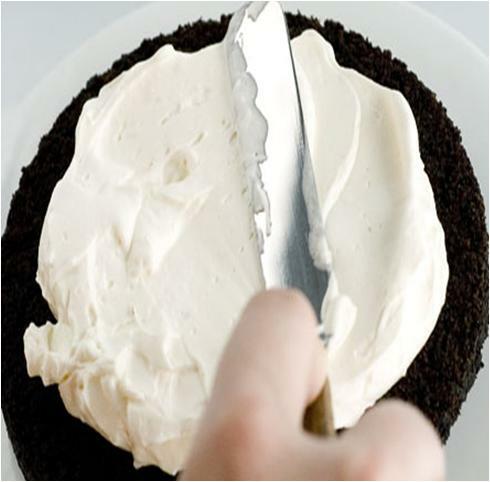 Take a bench scraper, hold it at an angle of 45 degree and gently start smoothing the frosting from the sides of the cake. 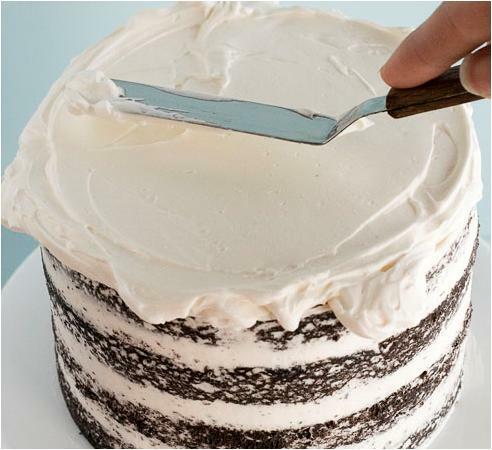 Sweep the bench scraper at least two or three times around the sides of your cake in order to even it completely. Note: You can add a little more frosting to your cake in case if you find any imperfections around the sides. Now, you can clearly see some uneven spots around the top corners of the cake. However, you do not have to worry at all. Take a longer spatula, and place it just away from the side furthest from you at about 45 degree angle. Align the bottom edge of the 45-degree spatula with what you estimate to be the height of the inner coating of frosting and scrap it gently towards yourself. 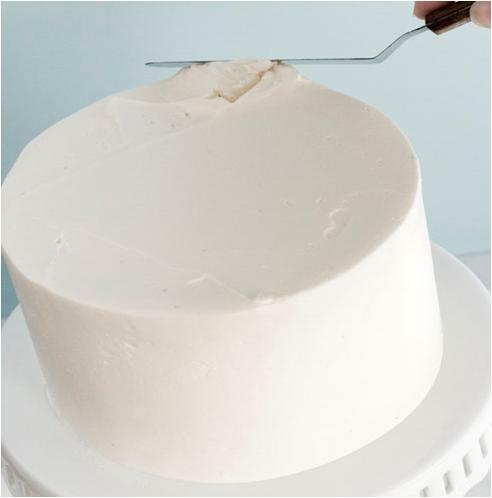 Sweep off the extra frosting when you get to the center of the cake and clean the offset spatula. Check out your frosted cake from all sides in order to find out if there is any uneven surface and scrap it off if you find any. 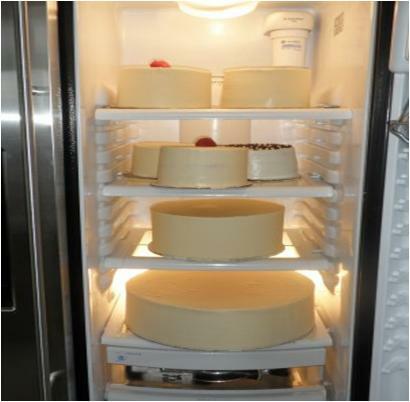 Place the frosted cake in your refrigerator until cool properly. Otherwise, the frosting will melt and can destroy all your efforts. You cake is frosted magnificently. You can either decorate the frosted cake any way you like or just leave it as is.